Three of the most popular Red Line products for V-Twin bikes are 20W50 Motorcycle Oil, 20W60 Motorcycle Oil and Red Line Complete Fuel System Cleaner for Motorcycles. The connection between Red Line and American V-Twin motorcycles goes back to the early '80s. The past 30 years produced tremendous support for Red Line from experts in the racing and road bike communities, including the AHDRA Drags, AMA dirt track and road racing, and the performance and cruising scenes at Daytona and Sturgis. Legendary V-Twin builders like Bill Werner and Kenny Tolbert, respected tuners like Hal's Speed Shop, Dan Fitzmaurice's Zippers outfit, NHRA Champs like Matt Smith and Byron Hines rely on Red Line to control wear, make power, and increase reliability. 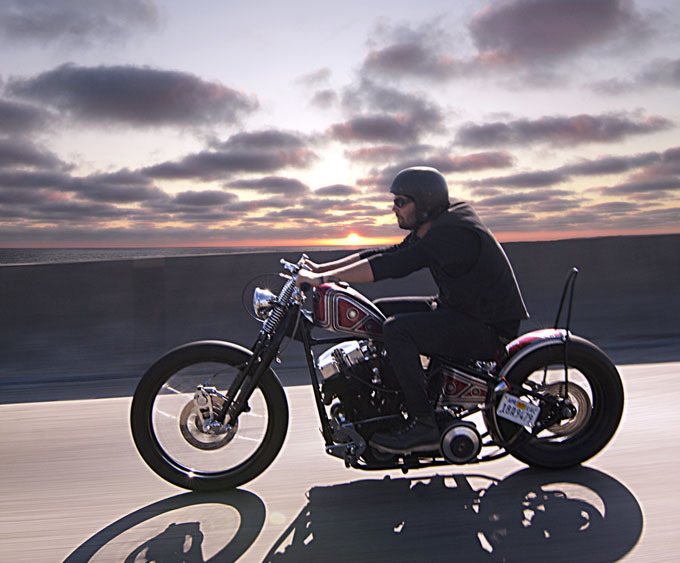 The same principles apply to all of the popular bikes, from Panhead and Shovelhead, to Evos and the latest production bikes. The V-Twin challenge is obvious: air-cooled engines demand more from motor oil. What happens when you run lesser conventional oils, low-cost "synthetic" blends like Syn 3® or Royal Purple®, and PAO synthetics like Mobil® or Amsoil®? You find excessive wear in the cam journals and lifters due to shortages of antiwear additives. This photo illustrates the oil pump from a Twin Cam engine. You can see the wear on the g-rotor as well as in the oil pump body. This is better controlled by using Red Line's 20W50 Motorcycle Oil with more antiwear and stable viscosity. If this pump fails, not only will oil flow stop but a chunk of metal will likely junk the rest of the engine. This is in addition to premature main bearing, rod bearing, and valve guide wear (leading to oil consumption). Shorter valve spring life and lower spring tension due to high heat can be a result of low-cost base stocks. Lack of film strength also leads to excessive piston wear (including scuffing on the skirts). Lack of cleanliness causes carbon buildup in the ring lands. Combined with poor piston wear, you get lower ring seal and less power from your bike. Where the latest bikes feature EFI, most of the V-Twin market is carbureted—even when you nail the jetting, you'll get more fuel dilution with a carbureted bike and that challenges the film strength of lesser products. There are many benefits to running Red Line’s ester-based motorcycle oils. Unprecedented stability over a wide temperature range is due to an investment in only the best base stocks, a bountiful additive package of zinc, phosphorus, and motorcycle-compatible friction modifiers make it the ultimate protection for American V-Twins. High detergency levels combat the buildup of carbon that depletes ring seal. Decades of R&D have gone into this product, so that kind of detail cannot be summarized in a few simpleparagraphs. But, the best engine builders say it better than we can. Many times, the lack of wear in the parts tells the story for them. This photo shows the stock camshafts from a typical Twin Cam engine with 40,000 miles that was filled with the synthetic motor oil recommended by the manufacturer during scheduled maintenance at an authorized dealer. The dramatic wear on the lobes and a totally blue cam journal could be avoided with more antiwear and a more stable ester formula. Note that aftermarket cams will show the same wear and heat, but better oil solves these problems. Rob Schopf of Hal's Speed Shop says it best: "The engines we take apart after running Red Line motor oils simply don’t have problems. That’s why we recommend them." Credit Harley-Davidson® with major improvements in their latest engine designs, especially in terms of cam plate design. H-D engineered a solution that removed the bearing setup, a great improvement. They also equipped the newer 96-inch engines (07-09) with a revised oil pump that scavenges 22% more oil, feeds 8% more than the older engines stock engines, and produces 8% more volume. "Time will tell in terms of wear on the new bikes," Schopf says, but these revisions produce a nice reliability gain. Regardless, there’s still damage to be done by selecting motor oil by price rather than all-out performance. That mostly depends on where you live. Our 20W60 Motorcycle Oil is likely required only in the hottest climates like Phoenix or Las Vegas, or with the wide engine clearances that come from Knuckle, Pan, or Shovelheads. We find that many customers looking to dampen valve train noise or seal leaky bores use our 20W50 Motorcycle Oil. Even with giant displacement, fantastic cylinder heads and an aggressive cam, our 20W50 holds up. After all, it holds its viscosity longer than the conventional and "synthetic" blends recommended by the major manufacturers. Do you see where the bore is worn at the top section? 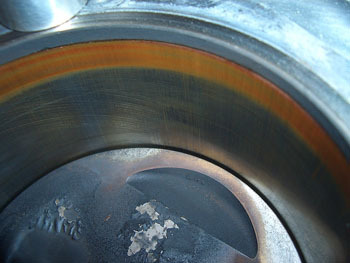 This oblong section of the bore is cause dby the cylinder distorting under the high heat associated with lesser oils. The score marks show that the piston rings aren't even making contact with the full cylinder bore! No wonder there's a loss of power. The carbon seen can be relieved by Red Line's Complete Fuel System Cleaner for Motorcycles. 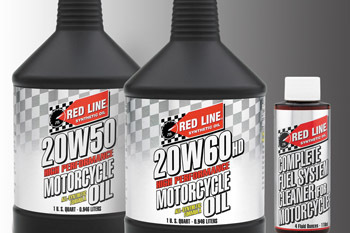 Red Line's 20W50 Motorcycle Oil is the correct product for use in aftermarket Big Twins like those from S&S and RevTech. The V-Rod® and other cruisers should run this product, too, as it has been formulated to be compatible with wet clutch configurations. Sportster® engines can use this product, too. HOW ABOUT OTHER MOTOR OILS? Here are a few tips for using other Red Line motor oils in your V-Twin. If you're road racing or doing serious track days on a Buell®, try our 50WT Race Oil in your engine. You'll get a bit more power from a slicker formula and more protection from the even-higher dose of antiwear additives. However, race oils feature dramatically less detergency, so you'll have to change it more often. Drag racing typically uses lower viscosities due to the low oil temperature that comes from shorter operating time. But, remember not to run extremely light oils on the street in your air-cooled engine! Top Fuel racers like Doug Vancil don’t use our 70WT Nitro Motor Oil. Their bikes have dramatically smaller fuel pumps than a Top Fuel Dragster (for which that 70WT is designed), and it’s the fuel that wears out oil in drag racing—these teams run 50WT Race and 60WT Race blends depending on conditions. The same goes for teams running methanol. Notice that the cross hatch is almost worn away from an inferior oil's collection of heat. The vertical marks here better show the only place where the ring is making good contact for a seal. Again, using a stable, ester-based oil that reduces heat buildup dramatically solves these problems. It controls piston and ring wear, too. We hope that helps you sort out some of the silly things that you read in the forums or on the websites of competing oil companies. Thanks for the support and we’ll see you on the road. CLICK HERE for Red Line's V-TwinTransmission Tech Article. Harley-Davidson, H-D, Syn3, Sportster and V-Rod are registered trademarks of the Harley-Davidson Corporation. Amsoil is a registered tade mark of Amsoil, Inc.
Royal Purple is a registered trademark of Royal Purple, Ltd.
Mobil 1 is a registered trademark of Exxon Mobil Corp.